Finding the right pair of running shoes can be overwhelming. There are so many styles and designs to choose from and there is new science on running being done all the time. It can be hard to keep up! So what are we, the long-time lovers of running, the marathoners in the making, the casual Sunday runners and the new initiates of the sport supposed to do? We talked to the professionals to learn their secrets to finding the perfect pair of running shoes. These are the top ten tips for anyone looking to buy a new pair of running shoes. 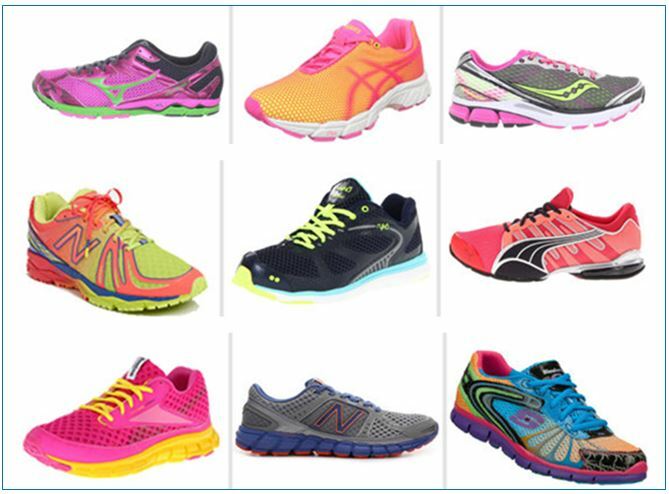 Don’t pick your running shoe based on color or fashion design. Fashions come and go but that cool color won’t keep your foot supported and that flame design won’t make you any faster. 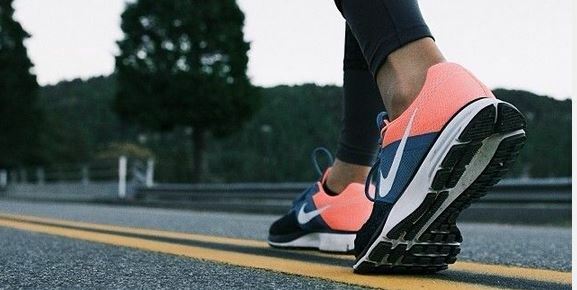 Let’s face it, we all want to look good while we’re running, but experts say, people who buy their shoes based on looks are often back at the store complaining of pain within a few months. So don’t go straight for that flashy looking pair on the display shelf, it’s better to focus on the feel and the fit when shopping for a new pairs of shoes. Give yourself the best chance of finding the right fit by shopping in the evening. People often go shoe shopping in the morning or early afternoon but then find their new shoes hurting them in the evening. This is because our feet swell during the day. We need to buy shoes that fit our feet in the evening when they are at their largest in order to get the ultimate fit and comfort level. If the shoe fits well in the evening, it should feel good all day. When was the last time you had your feet measured? If it was sometime around the 8th grade it’s no wonder your feet are hurting. Shoe fitters see this all the time. People assume that a size is a size no matter the brand. Unfortunately, this isn’t the case. Sizes vary between brands and between each design. That is why it is important to have your feet measured every time you go shopping, and always try them on before you buy. Before you put on a new running shoe check to see where the flex point is. To do this, hold the heel and press the tip of the shoe onto the floor or other hard surface. Make sure that the flex line of your foot is the same as the line of the shoe when bent. When the flex point of your shoe is improperly aligned, you can develop arch pain or plantar fasciitis, while a shoe that lacks flexibility can cause Achilles-tendon or calf strain. When you first slip a new shoe on, lace it up, but don’t tie it. Your heel should fit snug against the back but not be tight. You should be able to slide your foot in and out with ease. This is a sign of a well fitted shoe. Lacing the final eyelet should keep your foot from slipping out. Once tied, some heel movement should be expected but it shouldn’t feel uncomfortable. The top part of your shoe should hug your foot and feel secure around your instep. If you feel tightness, then you need more space. If you feel pressure under the laces, first, try lacing it up a different way, but if that doesn’t solve the problem you should move on to another shoe. If you feel any irritation or pressure when trying on a shoe in the store you can expect it be worse once you’re out on the road. Your feet swell and lengthen over the course of a run, so it is important to give your foot some extra room. You need a thumb’s width of space between your longest toe (which isn’t always your big toe) and the end of your shoe. Get someone to help measure the space at the end of your shoe while you stand with your shoes laced up. You should also be able to wiggle your toes freely up and down. This extra room will help to protect against pain caused from the top rubbing on your toes. You should also be able to move your foot from side-to-side at the front of the shoe. The insole should be wide enough that your side-to-side movement stays on the insole. Try pinching a quarter inch of material on the top of the shoe along the widest part of your foot. If the shoe is too narrow, you’ll feel the base of your little toe sitting on the side of the shoe instead of the insole. Narrow shoes can cause rubbing and pain on the sides of your feet and toes. You can’t get a feel for a running shoe just by standing in it. Take your potential running shoes for a test run to see how they feel on the go. If the store has a treadmill use that or find a hallway you can run freely in. Make sure the arch support feels natural when you’re in motion. If you feel your arch cramping, look for a shoe with a different support. Once you’ve located your perfect running shoes, don’t be afraid to ask about discounts. Lots of stores offer discounts to running club members, anywhere from 10 to 20 percent. There might also be online or flyer deals you can take advantage of if you check at the cash register.